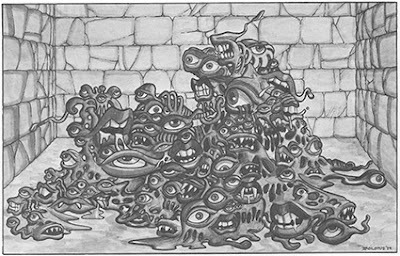 C1 The Hidden Shrine of Tamoachan has an aura of pulpy danger that seems to call to players like moths to an old school flame. Hidden treasure, danger, & some very weird old school flavor seem to add to trap laden old school play. But what if you want to place it within your favorite old school home game campaign setting? What about a more pulpy sword & sorcery angle? Alright so let's quickly talk about the second part of this nebulous campaign idea that a friend of mine talked with me about over the Easter holiday. Steve has been poking around the the Vaults of Pandius website & came across another Paleologos article. This time it was the X9/C1 Savage Coast/Hidden Shrine of Tamoachan mash-up by Paleologos. 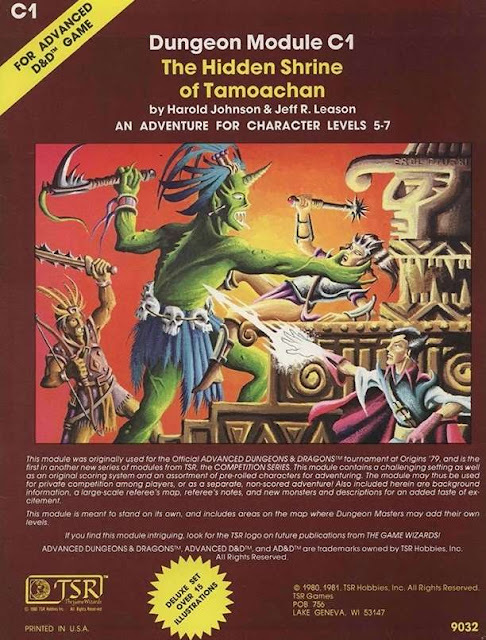 So let's talk about what's at the heart of this little bit of Tamoachan magick, "However, given that module C1 is notable for its Mayan and Aztec/Toltec trappings, it would fit almost seamlessly into module X9 "The Savage Coast", which otherwise suffers from a rather lackluster finale." 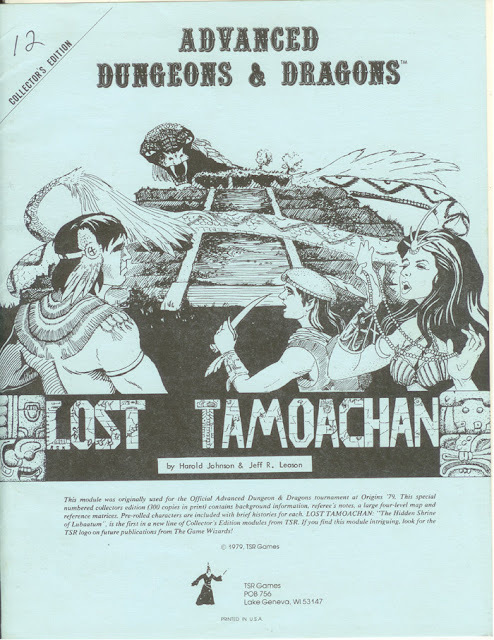 So this might mean that The Hidden Shrine of Tamoachan is simultaneously existing as both the the capitol of the Olman empire, which covered much of the continent south of Greyhawk & as a part of the Savage Coast in C1. There is a lot going on here where the "Central and South American flavour is masking far more that's bubbling below the surface of the adventure & the setting from Aztec & Mayan cultures connects across a myriad of worlds. We already know that the Lovecraft & Clark Ashton Smith elements are in C1. 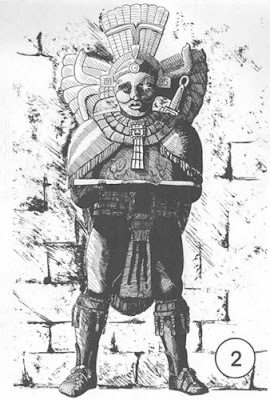 But this connects the weird religion & culture of the the ancient Olman people of Greyhawk, based on the Aztec, Mayan, and Toltec peoples of Earth into a whole new light & turns them into a far greater menace for old school games. Could they have cults spreading like cancers across the planes? This could help to explain the expansion as well as germination of the Gibbering Mouther and other Shoggoth like monsters. That were brought with the Olman. So what does this have to do with Astonishing Swordsmen & Sorcerers of Hyperborea? Well a few things, first of all it might interconnect two or more AD&D or D&D B/X campaign worlds with Hyperborea. These connections might even be through the Olman who were originally colonists on one of the myriad versions of the Warden. 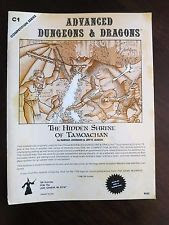 There is a Easter Egg that I found in the Drivethrurpg entry on C1;"There's also a peculiar connection in C1 to a later Greyhawk adventure. Room 19 of "Shrine" contains a figurine of a spaceship called the "II-Nedraw." Since the ship that crashed in S3: "Expedition to Barrier Peaks" (1980) was based on the Warden from Metamorphosis Alpha (1976), this could suggest a connection between that spaceship and the Tamoachan ruins." Could the Olman be simply colonists of the Hyperboreas who have come to be degenerate cultists spreading an Old One like religion across the planes & spreading a cancer like growth of dangerous plane sucking magick to various old school campaign settings? Well they will be in my upcoming campaigns. There are few things to remember about C1 The Hidden Shrine of Tamoachan is a competition module for PC's five to seventh level. It was created for the Official Advanced Dungeons & Dragons tournament at the 1979 Origins International Game Expo (Origins '79). So players brought their best & brightest PC's to pit against the adventure location and the dungeon. Not only are the PC's in compitition mode against other parties but against the dungeon itself. The Olman designed the entire works as a sacrifice engine to the gods and it could be doing exactly that across all of those campaign worlds including Hyperborea. So where is the magical energy from those sacrifices going? Could the Olman be a far greater danger to the planes then anyone releases? I personally think so. X9/C1 Savage Coast/Hidden Shrine of Tamoachan mash-up by Paleologos.